British Airways has confirmed it is considering fitting anti-missile systems to its aircraft to protect against terrorist attacks, as it resumes flights to Saudi Arabia after a security scare. The airline said on Friday it was in talks with aerospace firms on the anti-missile technology available, but said it was still "early days" for the project. It also said it would be resuming flights to Saudi Arabia on Saturday following the suspension of services last month for fear of a terrorist attack. Flights were suspended on 13 August after the Department for Transport said it had received "credible intelligence of a serious threat to UK aviation interests in Saudi Arabia". Confirming its interest in anti-missile systems, a BA spokeswoman said: "We are currently talking to manufacturers to understand the feasibility of deploying anti-missile systems on civilian aircraft." Experts have estimated installing anti-missile systems could cost BA up to £1m per plane. The airline has more than 300 aircraft. 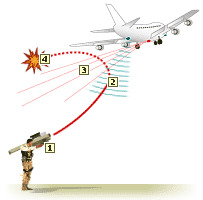 Fears of attacks on passenger airlines using surface-to-air (Sam) missiles have increased in recent months. Briton Hemant Lakhani was arrested in the US last month on charges of trying to sell a portable missile to an FBI agent posing as a member of al-Qaeda. And last year a shoulder-launched rocket was fired at an Israeli passenger jet over Kenya, narrowly missing the plane. Analysts say the main obstacle to putting anti-missile systems on commercial aircraft is the cost, and the limits as to how well airliners that fly slowly and unarmed can be protected. Israel's national carrier, El Al, already has protection systems and all other commercial carriers in the country are set to follow suit. All British airlines would have to approach safety regulator the Civil Aviation Authority before fitting new systems. A spokesman said: "We would have to ensure they didn't compromise existing safety systems, onboard electronics or the overall structure of the aircraft." 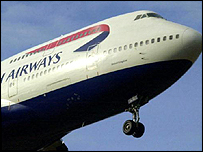 BA said it is currently considering its options and had "no fixed ideas" on dealing with the threat. The spokeswoman added: "Where there is a terrorist risk, we believe the most effective preventative is for the relevant authority to identify any likely launch site near airports." Missiles can be deflected by scattering "chaff" - fine filaments of aluminium - to confuse missiles which seek electromagnetic signals given out by a plane. For protection against heat-seeking missiles, lighted flares can be dropped by an aircraft to draw off the incoming weapon. Could your airline stop a missile? But flares would cause chaos if released near an airport, said aviation experts. Lasers can also be used as a more costly, but safer, alternative. Missiles could be detected by means of a sensor on the fuselage, which would scan for approaching rockets and automatically trigger the defence system. BA already spends £100m per year on security, and recently completed fitting new security doors which separate the passenger section from the cockpit. The company's services to Saudi Arabia will resume on Saturday with a London-Riyadh flight, followed by a London-Jeddah service on Sunday. BA said the decision followed "a thorough review of security in and around Riyadh and Jeddah airports, in co-operation with the UK Government's Department for Transport and the Saudi authorities". On Thursday it was reported that Saudi authorities had seized missiles near Jeddah airport last month capable of bringing down a passenger aircraft. Geoff Want, BA's director of safety and security, said they would continue to liaise with the Department for Transport and will keep the situation under close review. "We will not fly to any destination unless we are satisfied it is safe to do so," he said. The Foreign Office also said on Friday that "further large or small scale attacks against Western interests in Saudi Arabia remain likely". The airline resumed flights to Mombasa in Kenya on Thursday, following a ban of nearly four months. "Airlines are looking to whatever technology they can to protect their planes"